Create ultra-secure passwords for multiple accounts with ease. Is there a better alternative to Random Password Generator? Is Random Password Generator really the best app in Security category? 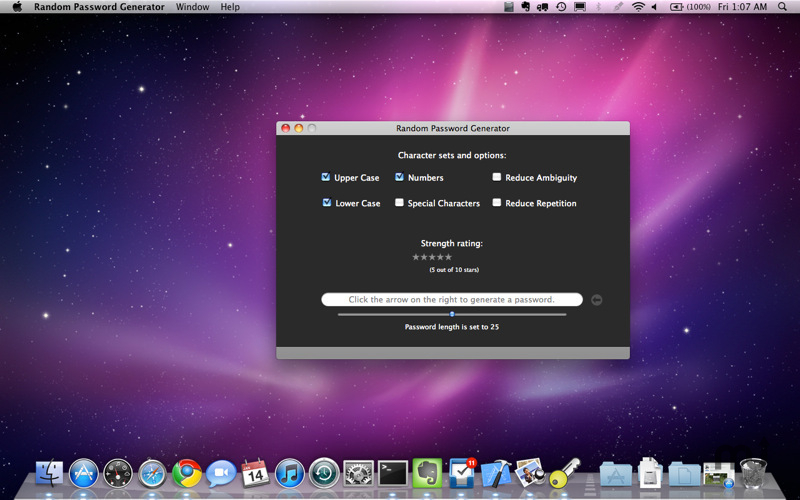 Will Random Password Generator work good on macOS 10.13.4? Random Password Generator is here! Create ultra secure passwords for all your accounts with ease! You can choose from 4 alphabets including: upper case letters, lower case letters, numbers and punctuation. Ever copied a password on a piece of paper and couldn't recall whether one of the characters was a number or letter? With Random Password Generator you can reduce password ambiguity by not combining letters that can lead to confusion such as O and 0, l and 1, etc. Our program also allows you to make your passwords stronger by reducing repetition of both strings and characters. Random Password Generator now automatically copies generated passwords to the clipboard! Thanks to user pointed out this missing feature!! Random Password Generator needs a rating. Be the first to rate this app and get the discussion started! The convenient star rating system shows the strength of the password you generated so you can always be sure your passwords are strong. Passwords are automatically copied to the clipboard so they are ready for instant use!